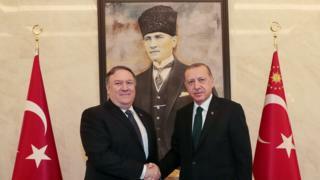 US Secretary of State Mike Pompeo has held talks with the Turkish President Recep Tayyip Erdogan about missing Saudi journalist Jamal Khashoggi. The meeting in Ankara comes amid fresh allegations in the Turkish media that Mr Khashoggi was killed inside the Saudi consulate in Istanbul. On Tuesday, Mr Pompeo met Crown Prince Mohammed Bin Salman in Riyadh. He said Saudi Arabia’s leaders “strongly denied” involvement in the writer’s disappearance. The journalist, a critic of the Saudi leadership, was last seen entering the consulate on 2 October. Saudi Arabia initially said he had left the building unharmed. A pro-government Turkish newspaper has reported gruesome details alleging the writer was tortured and killed while inside the consulate. The New York Times reports that four of the 15 people named by the Turkish authorities as suspects in Mr Khashoggi’s disappearance have links to the powerful crown prince, while another is a senior figure in the country’s interior ministry. Mr Khashoggi had obtained US residency and the US is a key ally of Saudi Arabia. But US President Donald Trump has cautioned against rushing to blame Saudi Arabia over the case, telling the AP news agency that Riyadh was being treated as “guilty until proven innocent”. A search was due to be conducted on Tuesday of the consul’s residence, some 200m (656ft) away from the consulate. Meanwhile, Turkish investigators quoted by two news agencies say Monday’s search of the consulate itself has yielded more evidence that Mr Khashoggi was killed there. Mr Khashoggi, who has written for the Washington Post, arrived at the consulate at 13:14 local time on 2 October to obtain paperwork so he could marry his Turkish fiancée, Hatice Cengiz.